Hello there! Like many of you, I am just trying to catch the last remnants of summer, and despite the fact that I did not have too many choices in the fridge, I was able to combine leftover lentils, half of a baked sweet potato, and some Portobello mushrooms that had been sautéed with lots of garlic, balsamic vinegar, soy sauce, a little bit of Dijon mustard, olive oil and salt and pepper. As a norm I am not a burger kind of person, but I decided to give it a try. I mashed/mixed the potato and lentils with a fork, then added some of the mushrooms and formed a couple of patties which I then placed in my Panini Press and voilà, the patties came out fantastic! To serve I added a dollop of coriander pesto and that gave the patties the zing I was anticipating. 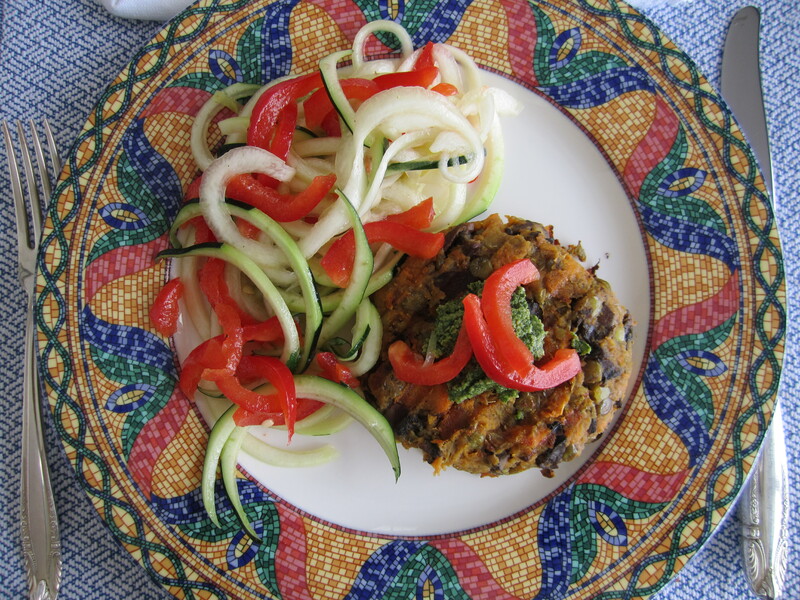 I paired my veggie patty plate with spiralized zucchini and julienned red peppers, to which I added some olive oil and apple cider vinegar, with salt and pepper to taste. The meal was successful and tasted pretty good for a leftover combo, with a dash of imagination! 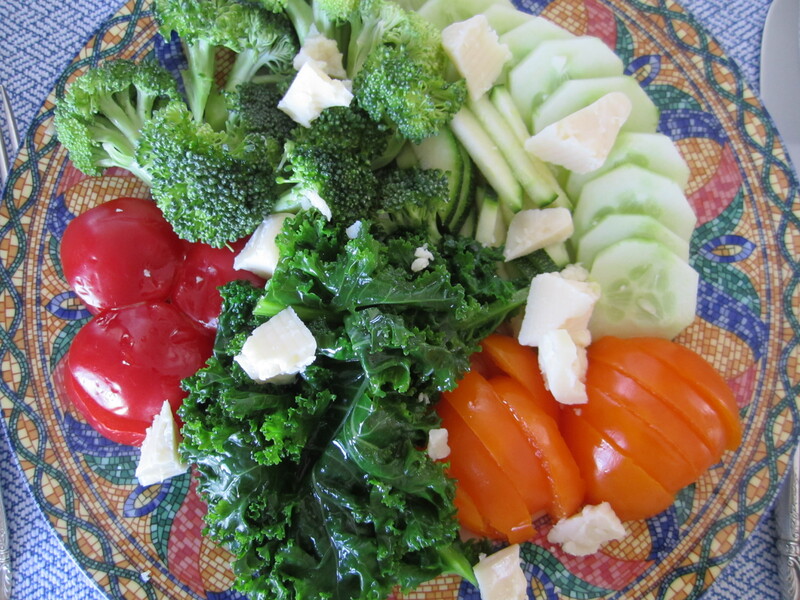 I love cheese and adding it to my customary vegetable plate makes it for a delicious addition. This time I decided to prepare my dish with broccoli, sliced zucchini, yellow tomatoes, cucumbers, kale and red peppers. The Asiago cheese chunks added so much flavour! Olive oil, apple cider vinegar, salt and pepper to taste. I often introduce into my diet different grains. One of my favorites is chickpeas, which I regularly add to my vegetable plates. I cook them at home, as I do not like the after taste that the canned variety leaves in your mouth. In this case, I mixed them with shredded carrots and feta cheese, and finished my plate with tomatoes, fennel, cucumbers, roasted red peppers and avocado. The customary extra virgin olive oil and white balsamic or apple cider vinegar finish this dish with lots of flavor! TIP : When you forget to soak the chickpeas overnight, the shortcut or quick method I use is to place the required quantity of chickpeas in a pot, add water and boil them for 5 minutes. Remove the pot from the heat and leave it for two hours. After the two hours, rinse the chickpeas and add fresh water and cook them until done! It would normally take me 45 minutes to an hour to cook the desired amount.